With trakdesk agent groups control, you can simply keep your agents organized in specific groups like: Information Technology, Product Support, Management and Sales. Dividing your agents into groups allows you to easily assign tickets, enable round robin auto assign so that tickets are evenly assign to agents in the group, setup restrictions for specific companies, manage workflow and generate in-depth reports. Additionally, you can easily escalate your tickets without having to worry about copy and paste ticket details, upload attachments, keep track of email responses and send a ton of emails and follow-ups, you can simply do it all in one click. 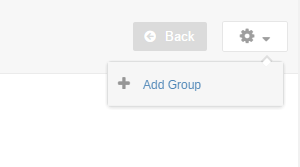 At the Top Right of the page, click on the drop down menu and select Add Group. Now, enter a unique name and a brief description for the group. 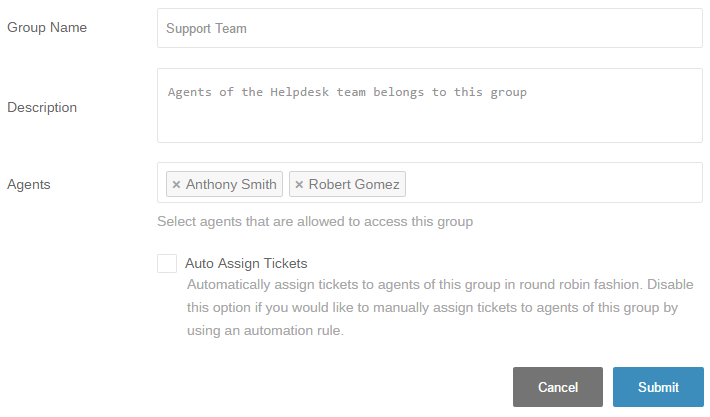 You can also assign specific agents to this group and enable automatic ticket assignment via round robin. Another thing to note is that automatic ticket assignment is intended to work with incoming emails only, ticket that are manually created in your helpdesk or customer support portal will not be assigned via round robin. If you need to assign tickets for these channels, you can setup an event trigger automation rule to do so.